Israeli soldiers abducted, earlier on Thursday morning, three Palestinian men at a number of military roadblocks, in the southern part of the occupied West Bank, and also stormed and searched many homes. 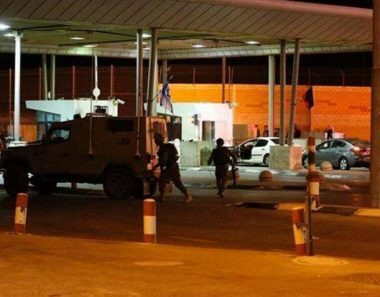 Media sources in Hebron said the soldiers abducted Mos’ab Salam Eghneimat, 19, and Mohammad Ahmad Hmeidat, 33, after stopping them at the al-Jab’a military roadblock, near the main entrance of Surif town, east of Hebron. The soldiers also installed a roadblock at the main entrance of the ath-Thaheriyya town, south of Hebron, stopped and searched dozens of cars, searched them and abducted one Palestinian, identified as Sameh ‘Alaa Shahin. In Hebron city, the soldiers invaded the Hebron University area, before storming and searching many homes, and interrogated several Palestinians while inspecting their ID cards. n addition, the soldiers installed roadblocks in Wad ash-Shajni area, while many army vehicles were deployed at the main entrance of the al-Fawwar refugee camp, and many towns, south of Hebron.